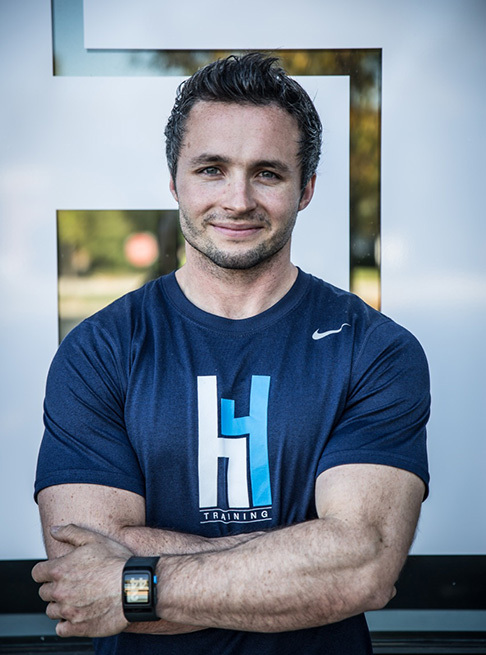 Hank Ebeling is the Owner and Lead Coach at H4 Training. 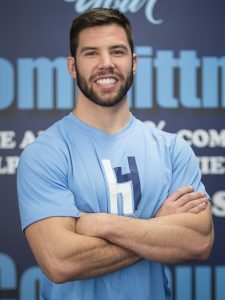 His training systems have helped countless clients achieve their goals and get into the best shape of their lives. 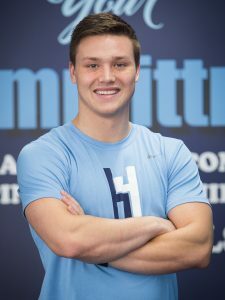 As a former football player and track athlete, Hank knows that hard work will lead to great results as long as you stay committed and consistent with your training. 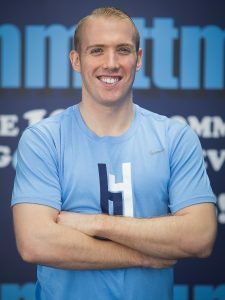 Hank has a Bachelor of Science degree in Kinesiology from University of Nevada-Las Vegas, and is certified by the American College of Sports Medicine. 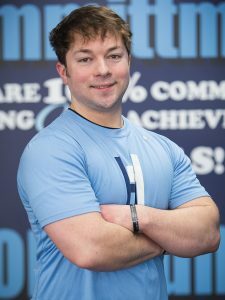 Hank has been in the training industry for 8+ years working on his craft at numerous health clubs and private training studios . 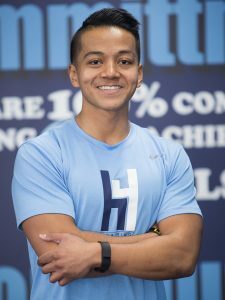 With a passion for fitness, he strives to empower his athletes and clients with knowledge so that they may continue to improve throughout their lives. Everyone in our facility is treated like family, we are the H4 Community! 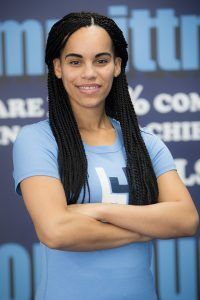 Amber graduated from Grand Valley State University on a scholarship to run track. While at Grand Valley she was part of the 2 time national champion track team. Amber has a degree in Physical Education with and emphasis in Sports Leadership/Sports Management. 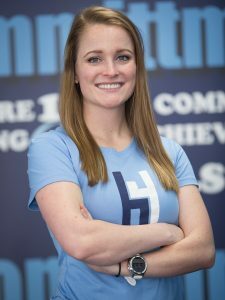 After graduating, she received her CPT through the National Academy of Sports Medicine (NASM). 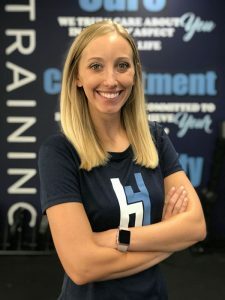 Professionally, outside of personal training, Amber has coached college track and field (sprints and hurdles); as well as run the strength and conditioning programs for both women’s swimming and basketball at the collegiate level. She has also organized and ran her own kids camps for strength and conditioning. Outside of athletics Amber is a wife and mother of two little girls. Began with H4 in Spring 2015. Degree in Exercise Science from North Central College. Favorite thing about H4? The positive environment and clients' willingness to commit to challenges. The sense of community that has been built upon a culture of coaches who care about every client and their personal fitness goals. I'm a 27 year old fitness fanatic who enjoys sports, self-improvement, reading and traveling. My wife and I welcomed the birth of our son, Leviticus Dash, on January 13th, 2017 and he has been our guiding light ever since. I've been at H4 since November 2016 and have had an absolute blast upon being brought on. Greatly looking forward to what the future has in store! Favorite thing about H4? I don't think I'm alone in saying the best thing about the H4 experience is the community! Being an introvert, I wasn't sure how my personality would resonate with both participants and fellow staff but I have to admit, every time I walk through the doors, there is a strong sense of welcome and comfortability in the H4 air. I can be myself and there's no judgment whatsoever each and every time. The sense of belonging and confidence is something I'm not sure I've really felt since my athletic days and it just feels incredible to be a part of. Favorite exercise has got to be using the sleds, either pushing or pulling, remind me of the good ole days when I played sports. My least favorite, not sure if I have one, but I would say an exercise I find very challenging would be the banana rolls. I find myself always struggling rolling all the way over for more than 3-4 reps. My favorite thing about H4 is definitely the community we all have together, clients and coaches. Everyone is comfortable around each other, and it feels like nothing is left untouched. It's just a cool feeling to know there are so many people as interested in you as you are in them! Studied Exercise Science with a minor in Psychology at North Central College. Studied Exercise Science with a minor in Psychology at North Central College. From Milledgeville, IL and always played sports growing up. Played softball at NCC for 2 years and was the 2015-2016 Exercise Science Major of the Year. H4 fav: The Community and Team Work! Love seeing everyone cheer each other one and power through a workout. I grew up in Geneva, IL, and graduated from the University of Alabama with a degree in Advertising (Roll Tide!). I discovered fitness is a true passion of mine, which fueled me to change career paths and become a personal trainer. I came to H4 in the spring of 2017 as a client. I instantly loved the challenge, as well as the support the coaches and other clients brought forward. I've been hooked ever since! Favorite thing about H4? The sense of belonging within the H4 Community. Seeing clients reach their goals is pretty awesome too. I have my degree in Exercise Science from North Central College (2014-2016). I have my degree in Exercise Science from North Central College (2014-2016). Fitness has truly been a passion of mine, however exercise has not always been a part of my lifestyle. I played basketball all throughout high-school, but never really lifted weights due to being intimated from the gym setting. So, H4 really implements the kind of environment I always saw myself being a part of and working for: making sure every client is welcomed, comfortable, and cared for. Favorite thing about H4? Easy: the clients. It takes me about an hour to get to H4, but that commute is a lot easier since I always look forward to working with every single client. The H4 Community is truly something special that cannot be replicated. I feel so fortunate to be part of such a great group. Tom will be finishing his degree from North Central College in 2016 with a Bachelor of Science in Exercise Science. Before joining the US Army Infantry, Tom graduated high school at Marmion Academy, where he played baseball and participated in JROTC. Favorite thing about H4? The unique camaraderie among diverse clientele and staff. Val is a graduate of Texas A&M University and was active in strength training and intramural sports during her time at Texas A&M. After college, Val spent her first five years working in corporate settings before deciding to spend the next few years at home raising her family. Val was a typical gym Mom, trying to stay fit & healthy. 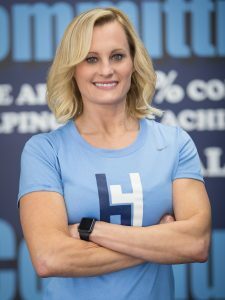 She began to take fitness more seriously and found a passion for strength training, HIIT, circuit training, & nutrition. Val really transformed her lifestyle and a fitness passion was born. The fire for sports medicine drove Val to help others on their fitness journey. Val is a NASM Certified Personal Trainer and TRX Suspension Certified Trainer. Prior to H4 she was a personal trainer in Northern Virginia & D.C. area. Val has a deep seeded belief that a healthy lifestyle will not only bring improvements on the outside, but more importantly on the inside! Val enjoys strength training, Olympic weightlifting, gymnastics, circuit training, running, & yoga. What I love about H4? 3 things...The People ! Hands down the best people walk through our doors everyday! Each client is respectful & kind (seriously cannot think of one that is not). Secondly, The team! 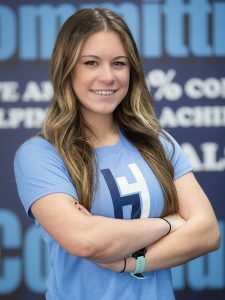 The H4 coaches are a great crew that truly care about every client. This H4 team is invested each person's experience & journey. Put this all together and this makes for one excellent community of friends & supporters. Grew up in Brookfield Illinois. Played 17 years of softball. Former 12 sport athlete in high school and 2 sport collegiate athlete. Currently studying a Degree in Exercise Sciences and a Minor in Coaching at North Central College. Favorite Thing at H4: My favorite thing about H4 Training is the amount of support our coaches and clients bring towards one another. It makes it feel rewarding to coach among the H4 community because I get to experience our clients enjoying their workouts, reaching their goals, leaving happy and looking forward to their next session.